When the Bank of Scotland recently carried out a survey asking people to name Great Scots, 'Wallace McIntosh - War Hero' was chosen among such illustrious names as John Logie Baird, David Livingstone and Robert Louis Stevenson. Born into grinding poverty, McIntosh was a few days old when given by his young mother to her parents to bring up. As a boy, he was trailed round Aberdeenshire and Perthshire in the 1920s while his grandparents desperately sought work and shelter. He had not heard of Christmas until he was seven, and never celebrated his birthday until his late teens, but he could steal, kill and skin a sheep before he was twelve and snare anything that could be cooked in a pot. Leaving school at thirteen he was determined to escape the constant struggle to survive. 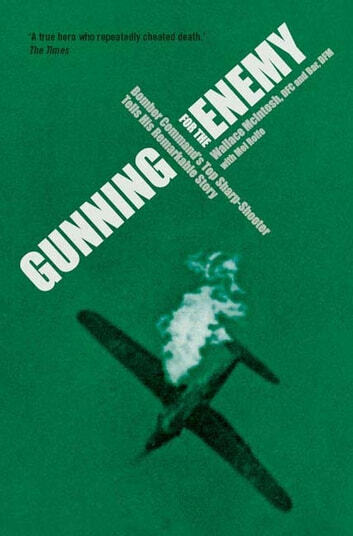 Gunning for the Enemy tells the moving story of how the RAF finally accepted McIntosh after at first rejecting him, but then initially gave him the lowliest of jobs. Only by a fluke was he trained as an air gunner. During his time with 207 Squadron, based at Langar, Nottinghamshire and Spilsby, Lincolnshire, he flew over fifty sorties in World War Two. Although Bomber Command did not record details of 'kills' by air gunners, Wallace, who shot down eight enemy aircraft with one probable, is widely believed to be its top sharpshooter and at one time he was its most decorated also. He had many hairy incidents and his prodigious memory for detail enables him to recall numerous amazing escapes from death and how each and every night he and his comrades dramatically took the war to the enemy. This is a story of outstanding courage, told with wit, pace and honesty by Mel Rolfe who has previously enjoyed acclaim with such books as To Hell and Back, Hell on Earth and Flying into Hell.